Is your body getting what it needs to be its healthiest, strongest, and most balanced? Rosalind Jackson, MD, can help you find out – and ensure any deficiencies are corrected. Through IV vitamins, she can help your body combat stress, aging, inflammation, and more. To learn more or to get started with IV vitamins, call Total Health and Wellness: Center for Personalized Medicine in Miamisburg, Ohio. Alternately, you can schedule your appointment online today. When you take vitamins in the form of a pill, they have to go through your body’s digestive process, decreasing their effectiveness. IV vitamins, on the other hand, deliver vitamins, minerals, and amino acids to where your body needs them: the cells themselves. IV vitamins are a powerful tool that can be used to eliminate nutritional deficiencies, reduce oxidative stress loads, detoxify your cellular metabolism, and correct intercellular deficiencies. In short, if your body isn’t getting what it needs to feel its best, IV vitamins can deliver. How do I know if I need IV vitamins? 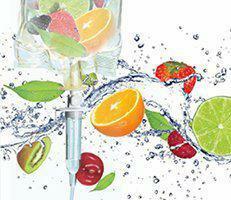 Determining whether IV vitamins are right for you comes down to listening to your body. If you’ve been feeling tired or stressed, have been easily getting sick, or can’t seem to get your allergies under control, your body might not have the resources it needs. Pay a visit to Dr. Roz and she can get you started with micronutrient testing. Through this blood test, she can analyze your white blood cells, pinpointing any deficiencies in your body. With that data, she can then recommend the right IV vitamins to restore your health and vitality. What kinds of IV vitamins are available? This IV vitamin cocktail is designed to deliver ultimate health, increased energy, and an immunity boost. Its blend of seven vitamins and minerals includes calcium, magnesium, B-complex, and vitamin C.
The working woman is no stranger to stress. Fortunately, this IV vitamin blend can help alleviate tension while delivering increased energy, focus, and alertness through a blend of B-complex vitamins and electrolytes. Glutathione can be added to any IV vitamins. People often choose this addition of “the mother of all antioxidants” for its ability to strengthen the body, help it recover, boost endurance, and support detoxification. If you’d like to support your overall health or target a specific deficiency, call Total Health and Wellness: Center for Personalized Medicine or schedule your appointment online to get started with IV vitamins.